I grow lilies. Lots of them! I have 8 different places where I have lily's planted. 3 of the flower beds are exclusively lilies, meaning no other plant grows there perennially. Two of my lily beds have other perennials in them and one has spaces for annuals. Some of the lilies I grow are quite beautiful but unfortunately when they die off for the year I'm left with scraggly empty looking beds. 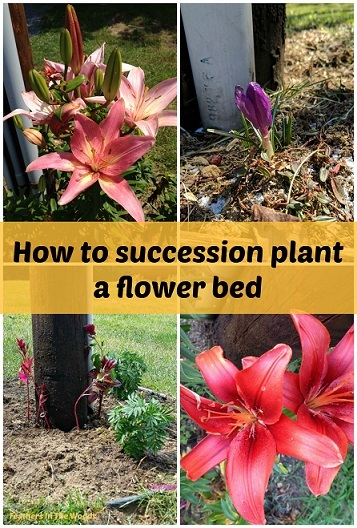 A few years back I came up with a plan to re-purpose those flower beds and have done it successfully for several years. By succession planting the flower beds I can guarantee flowers for the whole growing season. It looks pretty and it's good for the soil to have different plants growing in it annually. This year I started with the lilies by the driveway. I chose marigolds for the bees and I started them from seed. Had I used nursery starts I could have picked them up a few weeks ago. Many times I can find some great clearance buys and re-pot them to give them room to grow while I wait for the lilies to finish. I also had some Celosia that was growing in my carrots and I didn't plant them, so they needed moved. I'm guessing it was some sort of seed company accident. Either way, I let them grow out knowing I'd be moving them when the time came. Before I do anything else, I take a picture of the flower bed (if I haven't already) This is going to show me where my bulbs are planted after I cut the dry stalks down. Next I cut down the dry lily stalks. Some will come right out in your hands with no effort at all. If they don't then take sharp pruners and cut them off about an inch above the ground. Weed that bad boy. I tend to let things go between when the lily blooms have faded and when the stalks are dry. Now is the time to remove the weeds that have sprung up during that time. Decide where your plants are going in. From the picture I know my bulbs are all in the center of the bed....not close to the pole, not by the outer ring. 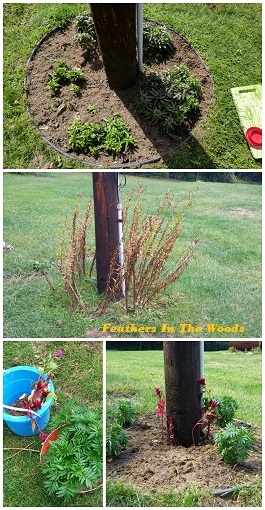 So I place the smaller plants close to the pole and the larger ones between the lily roots. You could also choose to use different types of bulbs like early blooming crocus or daffodils, then lily's to get twice the blooms that way. You can still add annuals after the lily's just be aware of where both sets of bulbs are. If they don't pop right off, don't pull or twist the stalks to get them out. Opt for cutting them instead to keep from injuring the bulbs. Leaving an inch above the ground when you cut gives you a visual reminder of where the bulbs are so you can avoid them. These stumps will dry up and in about a week they will pop right off when you push on them. Dig with your fingers. I wear rubber gloves not gardening gloves for this task so that I can feel if I hit a bulb. A shovel will damage a bulb or roots, fingers will not. Pick plants that spread and tolerate cooler weather. You want them to fill up the area quickly but not die off as soon as fall hits. The fewer plants you can get away with, the better. The goal is to not harm the lily bulbs so aim to dig as little as possible. Normally I go with 2 types of flowers that will spread so this is my first year trying something that grows straight up like the Celosia. I'll let you know how it works out! Next up is the 2 smallest lily beds, then I'll do the one by the shed which also has crocus bulbs that have long since finished for the year, but I'll still need to avoid them when planting! I'm hoping to find some small mums for the one bed, I'd love to see how long they last in the fall. Wish me luck! Thanks for joining The Maple Hill Hop this week!